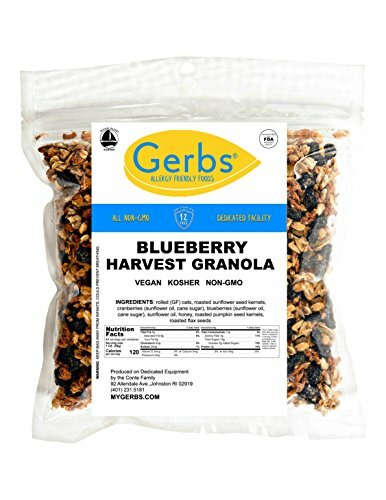 Gerbs Dried Blueberry Granola. Produced on 100% Dedicated Packaging Equipment. This deal includes 4 Pounds of Gerbs Gourmet Granola packaged in premium re-sealable zipper high barrier food grade poly bags yielding an All-Natural shelf life of 1 year without using any chemicals or preservatives. This product is Allergen Free and tested by the CSA, 100% All-Natural/NON-GMO, Vegan, and Kosher. Simply, there is no other Granola lines on the market as fresh as Gerbs, which taste homemade, while also being Allergen Free & Non-GMO. Order some day, have it in the morning with some milk or add it into some Greek Yogurt, we typically ship within 24-48 hours, and then taste what you have been missing!